Shop all new BANILA CO in Australia at Let’s Face It! The Banila Co Clean It Zero Original has been available at our store since the first day we opened. 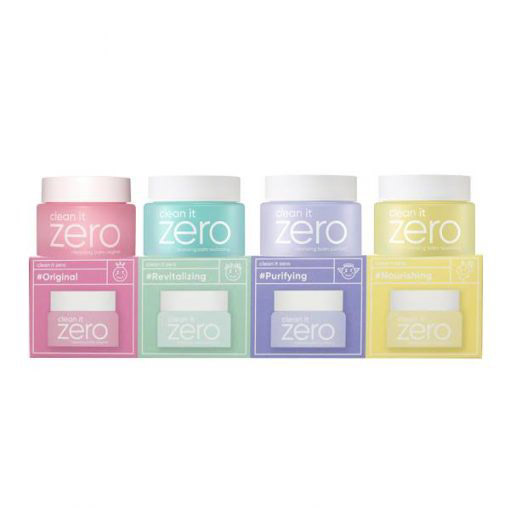 Recently, Banila Co renewed the formulas for their Clean It Zero range and also created a new addition! The whole Clean It Zero Cleansing Balm range is now available on our online store. Banila Co is a Korean Beauty brand that has been in the industry since 2005. This is a brand is recognised globally for its skincare, in particular, the original Clean It Zero Cleansing Balm. Banila Co have a strong focus on inventing skincare that is essential (cleansers) and also create a great base for flawless makeup application. Let’s Face It has the new 2018 Clean It Zero range by BANILA CO! In this renewed collection, 3 original Cleansing Balms have had their formulas and packaging revamped. There was also a new addition into the range, created specifically for those with dry skin. Banila Co Clean It Zero Original has had artificial colouring, mineral oil and other ingredients repalced with natural ingredients. Its star ingredients are Papaya Extract, Acerola Extract (rich in Vitamin C) and Hot Spring Water. Suited for all skin types. Much like the Original, the Banila Co Clean It Zero Revitalizing (previously Resveratrol) has also replaced artificial colouring and other ingredients (including Mineral Oil) with natural ingredients. The star ingredients are Resveratrol, Vitamin E, Grape Seed Oil & Olive Oil. Suitable for all skin types, especially oily skin and for anti-ageing. Banila Co Clean It Zero Purifying (previously Purity) already had an all-natural ingredient formula. Star ingredients include Centella Asiatica Extract and Licorice Root. Suited for sensitive and acne prone skin. All three balms have had the texture improved to be softer and smoother. Banila Co Clean It Zero Nourishing was created to nourish dry skin. Its formula also has the same soft and smooth texture and has no alcohol, artificial colouring, mineral oil or parabens. The star ingredients are Ginseng and Royal Jelly Extract. Shop this new range here. We offer free shipping Australia wide for orders over $60. For Sydneysiders who work or live near Sydney CBD (Pitt Street), we also offer a free click & collect option! Have you tried any of these new Banila Co cleansing balms? Which one do you love most? Let us know in the comments below!